I'd like to thank My Thoughts Are Like Butterflies for nominating me for a Liebster Award. 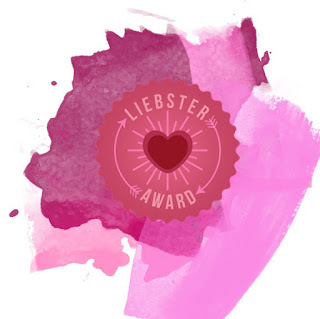 Pretty much everyone who's been nominated has never heard of this award before, but I'll bite because it never hurts to recognize my fellow bloggers! Also, because it's like a chain letter but without the "someone will die" threat that's all too common. Nominate up to 11 other bloggers with less than 200 followers. 1. What flavor note in tea just drives you happy crazy, you know is so good you kinda fall over in happiness? If it's 'chocolatey', it's probably gonna make me happy. 2. Most wonderful tea themed memory? Hard to choose one, but : having cream tea at Tea and Sympathy for the first time. Eye-opening. 3. What is your favorite game (it can be board, video, RPG, any game at all) and why? I'm not much for games, though a trivia-based game, whether board or video usually works for me! 4. What is the strangest dream you ever had? The one where I had to look for Mary I of England in the Lower East Side is up there. Coming across a well-written poem or novel, or a particularly moving painting at a museum moves me to do better. 6. Favorite place you have ever visited? 7. Favorite snack and why? Cereal - because it's fun! 8. Most disgusting thing you ever ate (on purpose)? Grasshopper from a taco. I can still feel that leg stuck in my throat. 9. Favorite post-apocalyptic setting? Why? Not big on post-apocalyptic settings, but I like Doctor Who, so any episode that falls in that category would be it, I suppose. 10. What is your favorite classic monster? Why? On the same theme, the Daleks. They're evil, but they are also pretty snarky - watch them face off with the Cybermen. 11. Favorite One Hit Wonder? Come on Eileen by Dexy's Midnight Runners makes me happy for no particular reason. What's a project you're currently working on? Name a book you're really into right now. You can automatically speak and read another language besides your mother tongue fluently - which language would you choose? You're planning a family/friend/fellow blogger/League of Evil gathering, and money is no object. In what location would this gathering take place, and why? Has your writing been published elsewhere? What is something that you view as a waste of time (not counting these questions)? Which sense leads you the most? Who sees you without makeup?